The Annapurna Sanctuary trek is perfect if you're time restricted but want to journey through an exceptional amphitheatre of rock and ice on a glorious scale. Immerse yourself in the extraordinary and hike with the snow-capped peaks of the Himalaya in background. 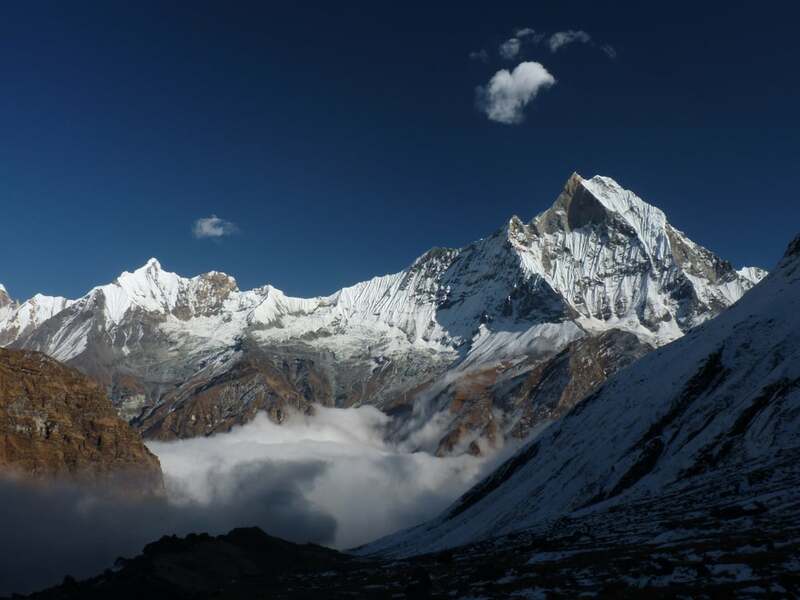 We also spend nights at both Machhapuchare Base Camp and Annapurna Base Camp which gives ample time and opportunity to really absorb the spectacular surroundings. The sanctuary will lead you through a hidden pocket of lowland villages, meadow and rice terraces to a gorge of rhododendron forests and icy rivers that will end in glaciers and gigantic peaks. The Annapurna Sanctuary trek gives us 11 days of superb trekking, up into the heart of the Annapurna range. We pass below some of the highest mountains on earth as we follow the valley as it changes to a deep gorge and on to its its glaciated beginnings at the foot of the towering Annapurna. We take enough time to acclimatize well and to make the most of the superb setting to our trek, this includes making time to visit the hot springs at Jinnu, a real luxury on the trail. The facilities for visitors are of a high standard, as is the food. We generally offer tea house treks with overnight accommodation in comfortable lodges, but if you prefer we can also provide tented camps so you can concentrate on immersing yourself in a slow and easy daily routine, with only the elements, the mountains and the quiet character of the people to accompany you. For more information and booking please visit the Annapurna Sanctuary trek’s page on the Adventure Alternative UK website.